Laundries are generally hardworking spaces in the home. Here is a collection of ideas and tips to conceal laundry mess while making the most of the tricky spaces. 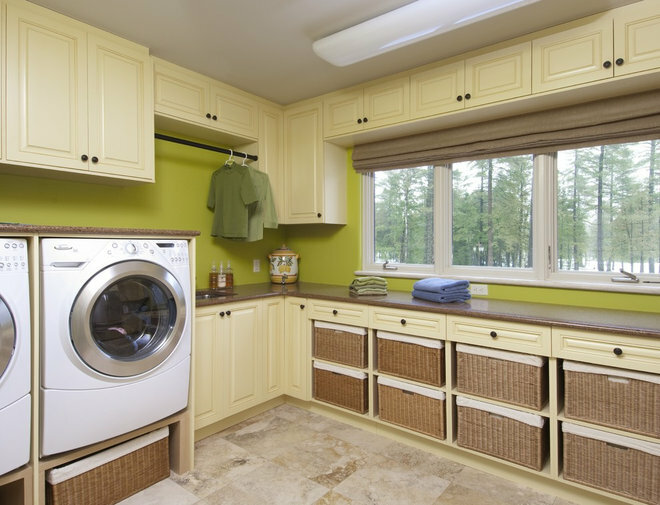 We’d all love to have a bright, large laundry with garden access. If you have this in your home, marvellous. But in many cases the laundry is much smaller than you’d like. 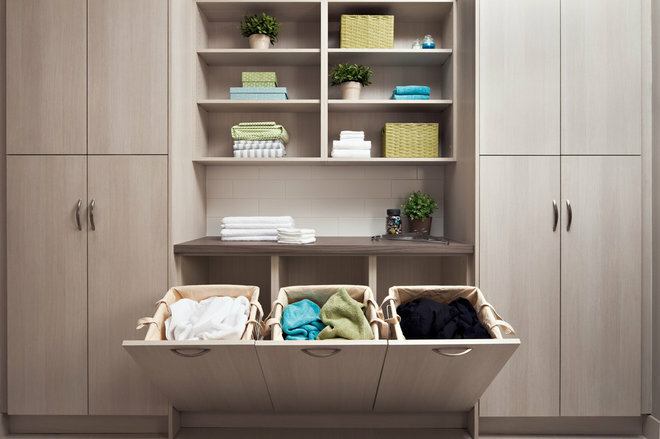 Regardless of what space you have, there is a wide variety of solutions to sort and conceal your laundry. 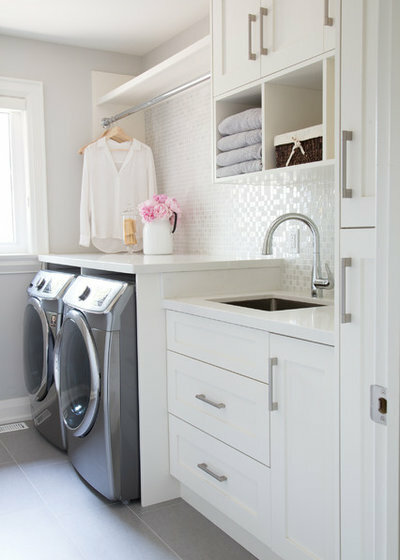 And a number of these laundry storage ideas can be incorporated into existing cabinetry without needing to undertake a large-scale renovation. 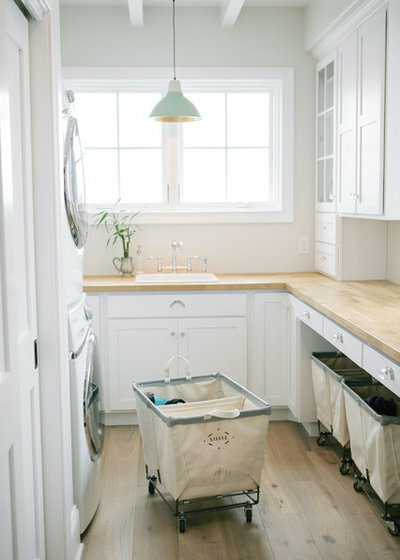 In a large laundry with lots of floor space, freestanding laundry baskets are great. If you have a large family (or live with lots of people), you might need more than one. They’re also a good way of sorting laundry. But you might find they eventually clutter the room, especially if your space is small. Having an open void beneath a benchtop where you can store laundry baskets is a simple yet effective way to use available space. The benchtop and upper cabinetry make it a multi-tasking area, which is essential in a small laundry. This small, yet highly functional, laundry ticks many boxes. The plastic laundry baskets are durable, easy to access, and have good storage capacity. 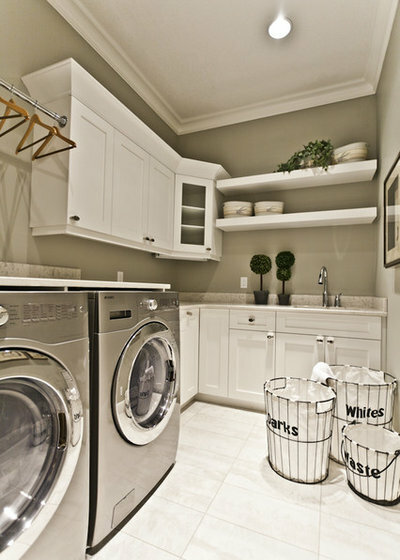 The stacked washer/dryer also free up under-bench space to create more storage. Tip: For highly organised and frequently used laundries, these simple rattan baskets on shelves are a great way to store and access laundry items. 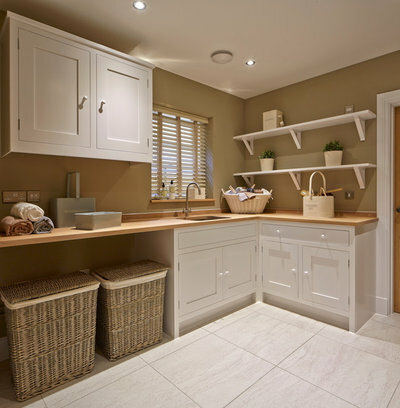 The elevated washing machine and dryer with rattan baskets beneath make this a highly functional space. 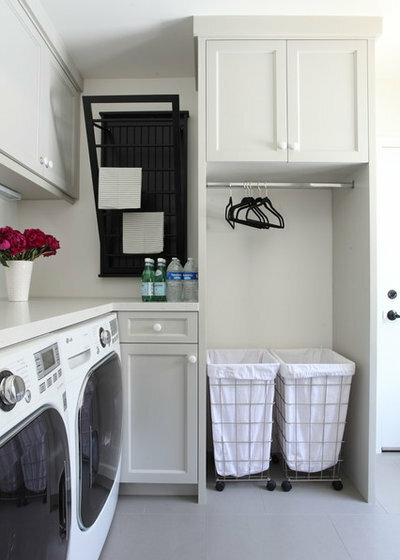 Wheeled laundry baskets are a convenient way of loading, unloading and storing laundry in a concealed place, such as beneath a bench or in a nook. 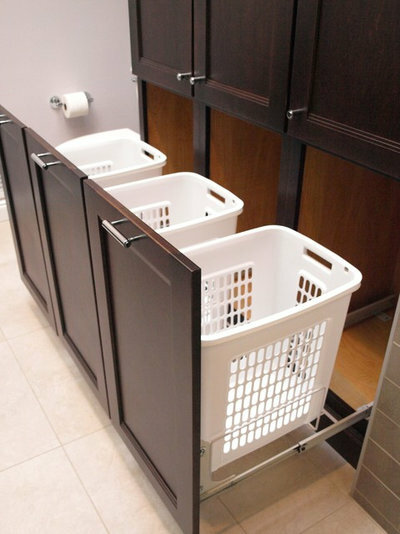 These baskets have excellent storage capacity and are good for large laundry rooms and equally large families. Having a hanging rod and two laundry hampers on wheels is a great way to use vertical space. 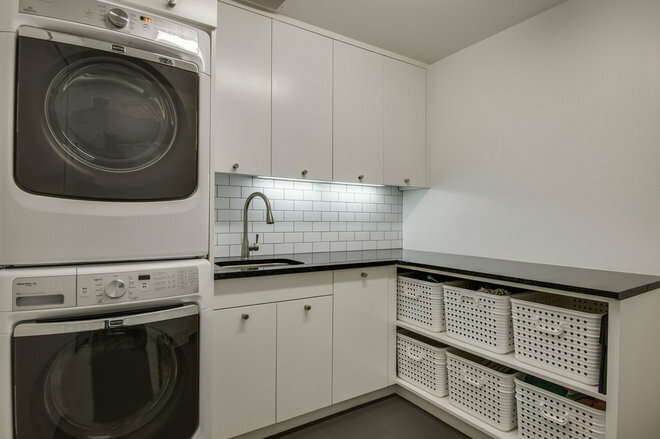 In this set-up, the laundry baskets are completely accessible and don’t clutter the circulation area, while providing easy access to the washing machine. The upper cabinetry also makes good use of the space, and provides additional storage for those items not required on a regular basis. A compact wall-mounted clothesline is a clever idea for laundry smalls. Bespoke drawers are a highly flexible solution that can work well if you have space constraints and specific storage requirements. They’re a good option for full-scale laundry renovations, although other options can be more economical. One downside of a solid box drawer is that damp laundry won’t breathe, so moisture and smells will build up over time. Tip: If you’re considering a wood/melamine-based drawer for a laundry basket, be cautious of storing wet items. Corners might need to be sealed to prevent seeping and swelling of raw materials. These come in a wide range of options and materials. If you are storing wet items, choose your materials wisely. Stainless-steel and aluminium are the most robust materials for wet areas. Chromed products also work well, but have limited warranties and might not have the same lifespan. Plastic-coated steel also gives good protection from moisture, but over time breaks and cracks in the coating may lead to rust. Some suppliers offer fabric liners to give you added functionality and stop small items slipping through the wires. Tip: For any type of pull-out storage system, regardless of price point, check the warranty and fine print. Many of these products can be costly, and warranties can range from a lifetime of cover to only 12 months. Also check the litre capacity because some laundry baskets have angled sides (i.e. not square) so they might look large in photos but will give you much less storage than you expect. There are many versions of the plastic laundry hamper. Plastic hampers are practical, durable and the holes allow for good aeration. Litre capacity is also generally good. Tip: The quality of the sliding mechanisms can vary, so check the warranty because the replacement cost of this may be high if in a few years things start to break down. Also, if you are opting for an off-the-shelf plastic hamper that a cabinet maker is adapting into a drawer, go for a style that is readily available should you need to replace it. These are great for concealing dirty laundry in a shallow cabinet. 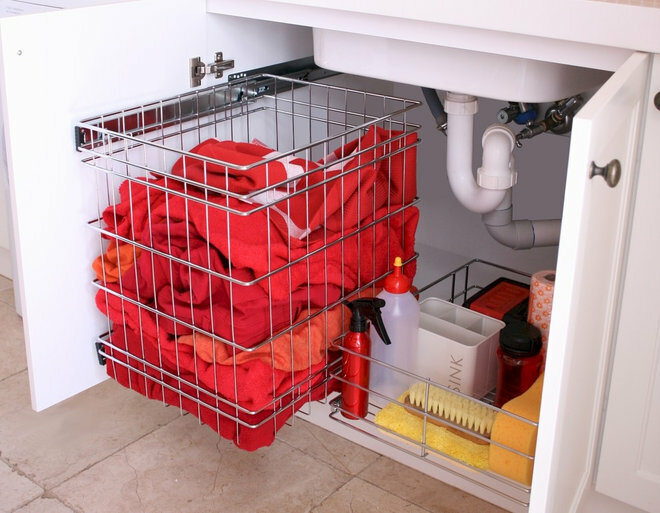 Many of these systems have a relatively small litre capacity so they are useful for small laundries – otherwise opt for several to give you as much storage as you require. Most people overlook this space because it’s tricky to work with all the plumbing obstructions. These cabinets can, however, offer lots of space to conceal slide-out laundry baskets and other storage. 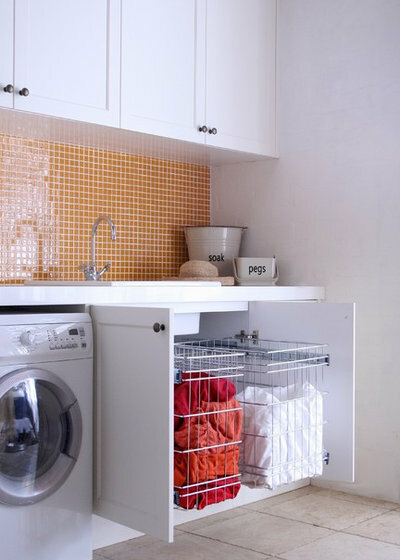 This can also be a great solution for tiny laundries where freestanding laundry baskets block narrow access areas. 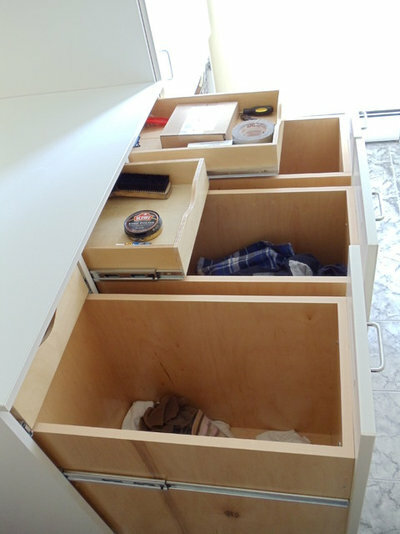 This clever piece of cabinetry uses space that would generally be considered unusable. 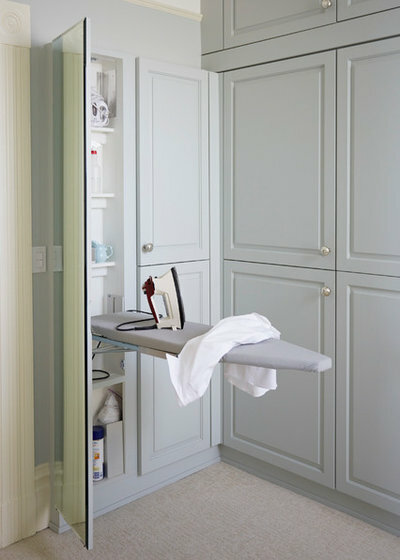 The fold-out ironing board and shelves are an impressive use of a tiny space, as well as being perfectly integrated into the cabinetry. Houzz Australia Contributor. Founder and director of Tansel Stainless Steel Wireware, I love all things storage, home and interiors. I have 13 years’ experience in product design and our home is a continuous renovation project. I’m a busy mother of two young boys and am delighted to be contributing to Houzz. My B. Econ, M. Mgt and Dip. Financial Service, as well as an earlier corporate career, continue to come in handy to this day.